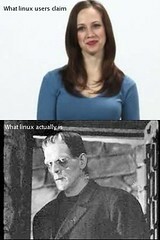 Linux : the myth and the reality Ouch. I think Sam’s been a little too harsh, but Novell’s video was a bit… awkward. I like the point (there’s more than just Windows vs Mac) but in an advert with a dull, inadequate Windows person and smug hipster Mac person, the Linux person should really have had a beard, worn a Think Geek shirt, and not actually said anything. Why have two stereotypes when you can have three?